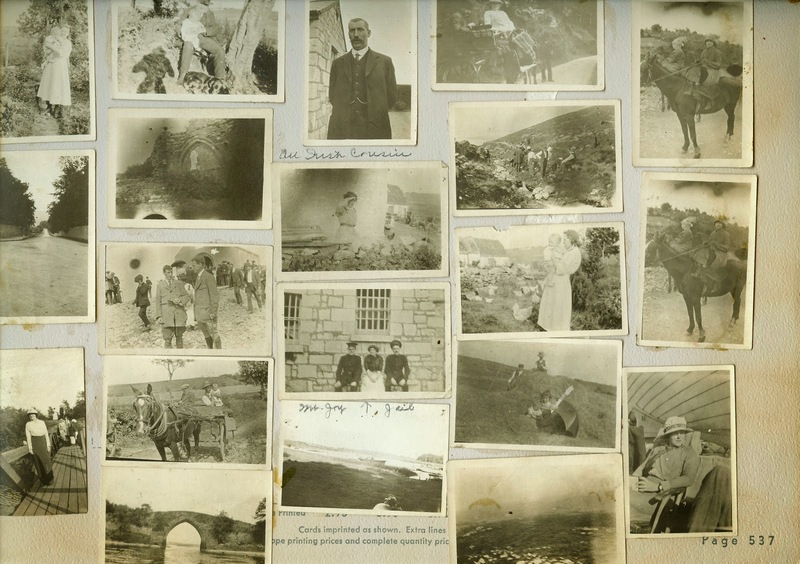 I have spent the last couple of weeks poring over my great-aunt Benita (McGinnis) McCormick’s collection of photographs from her trip to France and Ireland, amazed by the almost unseen details that reveal so much more about her than she ever told us. But I am also finding challenges as I try to identify the people and places she visited. The photographs in this collection measure only about 2 x 3 inches. As small as they were, Aunt Detty (as we called Benita) was able to fit as many as 23 on a page. She tried to label as many photos as possible, but some of the captions have left me guessing. She knew what “An Irish Cousin” meant, but I have no idea who any of those Irish cousins were. Other details are missing, such as places and dates. The scant clues that are there, though, give me hope in my research. I do not know when she left for Europe, but I do have a copy of the ocean liner’s passenger list home. Someday, I may find what and whom I am looking for, thanks to even these small tidbits she thought to include. There may be other reasons my aunt did not label many of her photographs, but one culprit stands out in particular: the scourge of time. Remember, these photos were small and sometimes faded. When Aunt Detty created this scrapbook in 1982, she was 93 years old. Her mind was still razor-sharp, but her eyes were not as good as they used to be, and even glasses could not always help spot the minutiae of details. With all that said, I am grateful for the considerable number of photos that Aunt Detty did label. In truth, she puts me to shame as far as labeling my own photographs is concerned. I have gotten better at labeling my digital collection, but most of the photos that predate them remain unlabeled. It might be advisable to swallow some of my own medicine and start working on them now, so my own descendants are not confused in the future! Happily, the technology of photo software and internet searches has improved the chances of learning more about some photos that might have otherwise gone ignored. I have been able to sharpen exposure, enlarge detail, and Google people, place names, and historical events. These techniques have allowed me to link photos, identify places I have never seen myself, and narrow down dates that give added significance to my aunt’s life history. As we shall see tomorrow, without the ability to do this, I might never have discovered that Aunt Detty, who I knew only as an elderly woman, once climbed rough terrain to one of the most sacred sites in all of Ireland. previous Previous post: Mystery Monday: Is this Lizzie Gaffney? How wonderful that the scrapbook is in such great shape and how frustrating that cousins' names were not marked in captions! I'm waiting to read the next in this saga. Luckily, I'm optimistic that I'll eventually piece together the puzzle of who they are and where they lived. Ah, the thrill of the hunt! Linda, I was just thinking about this same topic this morning, so your post's title really caught my eye. I stand as guilty as you are, yet struggle with and complain about the lack of labels on my ancestors' photos. I have some childhood pictures of my mother, diligently labeled by her mother with her age–down to how many months–but others that I don't recognize have not a trace of ink to help provide a clue. I'm the same way, though. I know who all those people are in my photo books! But someday, someone else won't. What I'd really love–aside from the time to scan everything taken pre-digital age–is a program where I can write a narrative next to photographs, as if I'm laying out the pages of a book. This morning, I felt the prompt to get going on writing up all I remember about each memory captured on film (not just name, place and date), as if creating a digital version of a scapbook. Glad I'm not the only one, Jacqi! I do use iPhoto (a Mac product) to write some narrative for my digital photos. I haven't found there to be any limit to the amount you can write. The program also lets me "tag" faces and places and adjust dates, which I find helpful. But there is always that challenge of adding information to the actual photographs without damaging them. I've thought about applying a label to the back with information, but then the ink might rub off on the photo behind the one I'm labeling! Guess that's where the Flip Pal comes in, so at least there's a scanned backup. Does anyone else want to weigh in on these questions?